Karla is our firm's Assistant Planner, and she helps in the development of financial plans, performs various types of research, and completes client service requests. Karla desires to help families achieve their financial goals. As the mother of three, she understands the challenges families face in balancing daily life with saving for the future, and she believes that developing a financial plan can be the roadmap every family needs to gain confidence in driving their financial future. She and her family reside at Devils Lake, so Karla spends most of her time at the branch office in Adrian, Michigan. 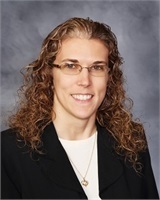 She has been an active member of the Lenawee County community for nearly twenty years, and she holds a Bachelor of Arts degree in Marketing from Siena Heights University where she served as president of Student Senate.